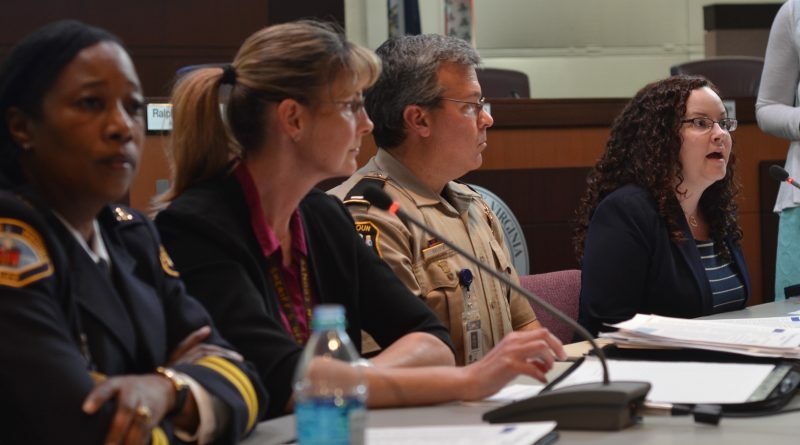 Loudoun’s Board of Supervisors did not have a meeting Tuesday night, but its board room was full with community members who wanted to know what more can be done to prevent domestic violence. The meeting was organized after Loudoun County saw its third domestic-related homicide of the year earlier this month. Christina Fisher, a mother of three, was shot in her Leesburg home on April 2. Fisher’s former boyfriend, Darrick Lee Lewis, has been charged with murder. She had obtained a protective order against him just weeks earlier. The uptick in people losing their lives at the hands of family members, spouses or exes prompted many in the community to ask what they can do to curb the violence and what signs of abuse to look for before it’s too late. What they heard from a panel of law enforcement officers, investigators, prosecutors and representatives from domestic violence prevention organization Tuesday was, actually, a lot is already being done. The meeting started with an announcement from County Chairwoman Phyllis J. Randall (D-At Large) that her office plans to create a permanent subcommittee to study how to prevent domestic abuse. The panel would likely operate under the auspices of the Family Services Board. “We’re looking to create a platform and a place where this issue will be addressed on a long-term basis,” she said. In the past decade, a wide range of services, positions and committees have been created—some through the help of state and federal grants—with the sole purpose of curbing domestic abuse in Loudoun. Among several positions that have been created in recent years are two prosecutor positions dedicated solely to domestic violence cases, and a full-time sergeant through the Loudoun County Sheriff’s Office whose job is to follow up after a domestic abuse-related arrest. “My position was established to help better prosecute the offenders … and let victims know it doesn’t’ stop here with the arrest,” Sgt. Janet Schmidt said. County deputies and Leesburg Police officers also provide a packet of information about available help—including how to obtain a protective order—to families when they respond to domestic violence calls. The two agencies launched a new protocol last month that has officers ask an 11-question survey, designed to identify victims who are in danger of being killed by their abusers. Victims considered high risk are immediately connected to Loudoun Abused Women’s Shelter, which provides free counseling, legal services and parenting classes for victims of any kind of abuse, not just physical. Plowman also told the audience about a multi-agency Domestic Violence Steering Committee. That committee formed the Loudoun County Domestic Abuse Response Team (DART), made up of “front line workers” from 10 agencies that focus on increasing offender accountability through law enforcement, the court system, and community services. She also noted that while it appears that domestic violence cases are up—because there have been more domestic-related homicides over the past few years—overall, domestic abuse calls have remained practically steady, even as the population has grown. Nicole Acosta, executive director of LAWS, said the nonprofit is open to giving presentations to churches or other community groups about signs of possible abuse and available resources. Her organization is also always looking for volunteers to answer their 24-hour hotline—after some intense training—or serve in other ways. And, she noted, that they could provide more training and presentations if they had more employees. “What do you need for more staff?” Savage asked. Those in the audience were also encouraged to speak up when they see a friend or neighbor in need. Jealousy, controlling behavior and possibly cursing or belittling comments can be signs of abuse. Although those are not illegal, they are signs that a person may need help. The panelists encouraged people to “see something, say something,” and call either law enforcement’s non-emergency numbers or LAWS. The sheriff’s office’s non-emergency line is 703-777-0445; Leesburg Police Department’s is 703-771-4500. LAWS’ 24-hour crisis hotline is 703-777-6552. In an emergency, dial 911.